As OKCTalk was first to report the owner of Cotter Ranch Tower filed for bankruptcy late last year. Like most of the assets of James F. Cotter, the building has been placed in the hands of the court-appointed administrator, San Antonio attorney Marcus P. Rogers, after a feud erupted between Cotter's children and his 3rd wife, Bettye Ruth Cotter. San Antonio was Cotter's long-time home and the headquarters for his businesses. In January, Rogers executed an Exclusive Listing Sales Agreement with the local office of CBRE which is also the acting property manager for the property. On February 21st, a Texas court signed an order approving that agreement and the following day CBRE issued an offering memorandum to a select number of potential purchasers and investors which included extensive details and financial information on Cotter Ranch Tower. Although the offering does not include an asking price, the listing agreement approved by the court shows that to be $25.5 million with the administrator of the estate reserving the right to “approve, modify, reject or disapprove all proposals” and “adjust the terms and conditions of any offer made including but not limited to adjusting the property's listing price”. Cotter bought the tower in 2004 for $27.9 million. Court documents list obligations of approximately $17.6 million to mortgage-holder Bank SNB, $324,000 in back property taxes to Oklahoma County and another $630,000 to various unsecured creditors. Built in 1972 at 100 N. Broadway in the heart of the central business district, marketing materials show the 36 story, 507,682 square foot building with a vacancy rate of approximately 42% including 7 full floors of contiguous space. Several of the building tenants have complained about lack of maintenance in the building and other services such erratic heat as occupancy has steadily declined over the last several years. The CBRE listing agreement calls for 1.5% commission on the total gross sales price and runs through July 31, 2018. OKCTalk has also learned that while waiting for the official court blessing of the listing agreement, discussions took place between the brokers and potential buyers with strong interest being demonstrated. 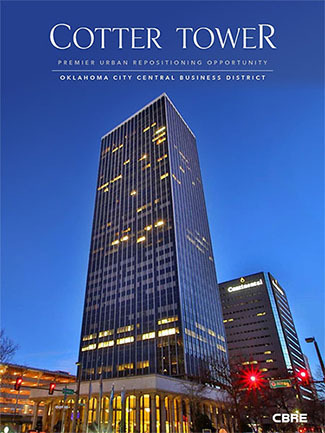 A website dedicated to marketing the building show the listing brokers as Amy Dunn, Eric Mackey, Jim Austin, Tom Lange all from CBRE's Oklahoma City office and Mary Claire Housman as the financial analyst from CBRE's Capital Markets division in Dallas. CBRE has also listed for sale Cotter's Lakepointe Towers at NW Expressway and NW 63rd.